The Tel Aviv Fashion Week is in my eyes a symbol of sanity. Beyond my personal interest in fashion, I was happy to see a large scale event aspiring to resemble the world’s capitols. To me, fashion is a daily celebration. Choosing what to wear and matching items give me pleasure and entail the joy of creation. Fashion should be celebrated on the street, not in fancy events and on catwalks. Fashion is lived every day. 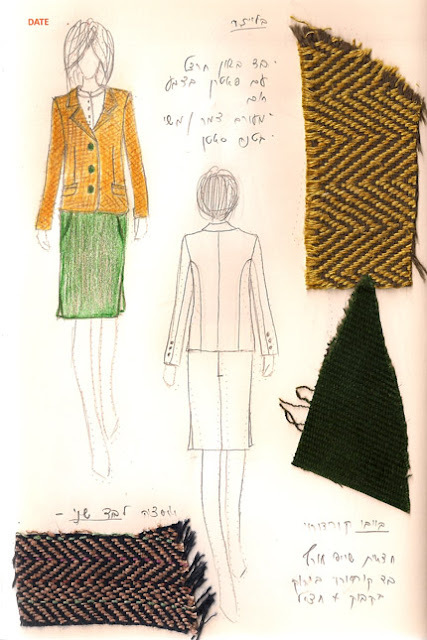 I designed a classic blazer made of mixed silk and wool, in a shade of mustard with a delicate brown pattern. Three greenish-mustard buttons on the front and three smaller matching buttons on each sleeve. The blazer has a high quality satin lining. It’s flattering, and light but warm. The skirt model is ‘Shape’ which I presented in the past. This time I made it suitable for winter, out of bottle-green Baby Corduroy. The fabric is called “baby” because the corduroy stripes are thin and gentle. The skirt is knee-high, with two front pockets and a slit on each side for a feminine look and comfortable walk. Like all the skirts I design, this skirt has an inner lining. The lining maintains the skirt’s shape while you wear it and even after a long sitting.